Paperback. 227pp. 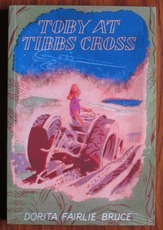 A war time sequel to the first two Toby books: The School on the Moorand The School in the Woods. Now a young adult Toby finds work on a farm during WWII. also involved is a character from one of the Nancy series books: Charity Sheringham. Also includes Dorita Fairlie Bruce and the Dunkirk Spirit, a 5 page essay by Mary Cadogan. Colour frontis and five further black and white illustrations.